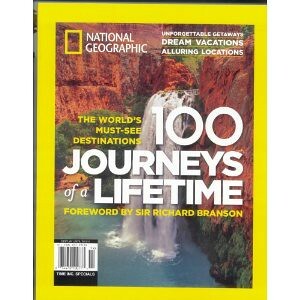 This Natgeo book caught my eye at the store, because Steve C & I led two trips down to Havasu falls. That is a fine place to visit. Expensive now, though. It is on and Indian reservation, and they charge $40 to enter, then $17 per night per person. What month of the year did you lead hikes down to Havasupi Falls? I and my friends had reservations in 2008 or 2009 just before a flood hit the canyon which I believe affected the Indian Reservation and motel. We had reservations for the motel in June, but read on the web that June is much too hot for people to be hiking down into the canyon unless a person is extremely experienced hiking in heat because the bottom of the canyon is hotter than at the rim. After reading this, we cancelled our trip and went to Yosemite instead. Havasupi Falls is still on our bucket list. If you have any advice, I'd love to hear it. I may be calling the Falls by the wrong name. Is Havasupi the Indian Tribe's name? We went first weekend in May, specifically to target the best weather. Fall would be ok, too, possibly late September. Temperatures are similar to Grand Canyon -- highs of 100+ in the summer! Check the Average Temperatures for Phantom Ranch, as elevations are similar. The village is named Supai, the general area is named Havasupai. The stream is Havasu Creek. The two main waterfalls are Havasu Falls and Mooney Falls. Good luck keeping all that straight!